Vancouver, British Columbia / TheNewswire / October 18, 2017 - Harvest Gold Corporation (TSX.V:HVG) ("Harvest Gold" or the "Company") and Evrim Resources Corp. ("Evrim") (TSX.V:EVM) are pleased to announce soil sampling results from its Phase 1 exploration program at the high-grade Cerro Cascaron gold-silver project in Mexico. The extensive soil sampling program covered an area of 4.5 kilometres by 1.6 kilometres north of the main gold vein field. 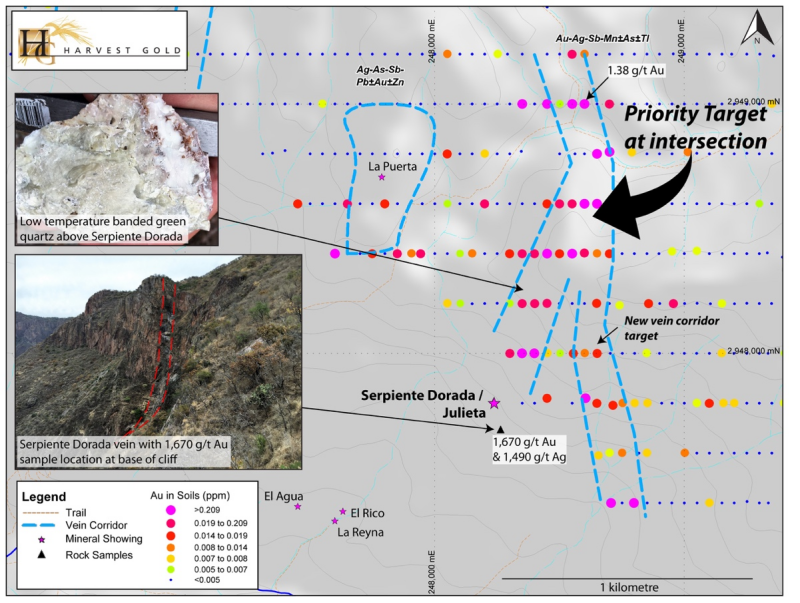 Results have extended known veins, identified two new corridors and have highlighted a 1.4 kilometre-long, very strong gold-silver trend to the north of the highly prospective Serpiente Dorada vein. Highly anomalous soil samples, including one that assayed 1.38 grams per tonne ("g/t") gold were also collected in the corridor where Serpiente Dorada intersects a newly identified, 1.8 kilometre long gold rich corridor (the "new vein corridor target"). This intersection is a very prospective target which is now a focus of the current mapping and drill targeting program. (see Figure 1). The area around the Serpiente Dorada vein and new vein corridor target define extensive gold and silver soil anomalies and arsenic and antimony anomalism. The known soil anomaly at Serpiente Dorada also suggests that significant gold-silver mineralization can be found over a range of elevation of at least 350 metres. Warren Bates, P. 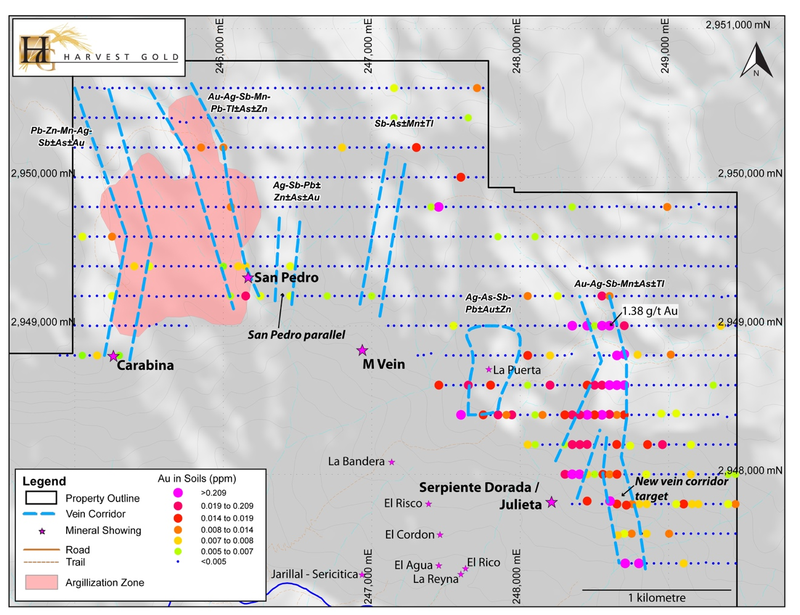 Geo., the Company's Director of Project Investigation said: "We are very pleased with the results of the soil sampling program, which has significantly extended the potential strike length of known gold bearing veins and has defined a very prospective intersection of a new vein corridor target and the Serpiente Dorada vein. The combination of initial rock sampling and mapping, results of the recent soil sampling, and the three-dimensional view provided by the project's 900 metre vertical cliff side topography and colonial era adits, allow us a very helpful perspective of the vertical size and potential of the high-grade gold veins in the project area. We await the conclusion of the mapping and sampling programs over the main Cascaron gold vein field that will allow us to finalize several drilling locations for our initial drill program." The pathfinder soil geochemistry strongly supports previous rock sampling, which, when combined, define several corridors with strike lengths ranging from 400 metres to 1.8 kilometres over seven known mineralized zones (See Figures 2 and 3 and Table 1). In addition to the new vein/Serpiente Dorado intersection, these other corridors also merit further exploration, including diamond drilling. Figure 2: Gold in soil sampling within the northern area of the main vein field, and known gold-silver occurrences. Figure 3: Clockwise from top left. Silver (Ag), Lead (Pb), Manganese (Mn), Barium (Ba), Mercury (Hg) and Antimony (Sb) in soil sampling within the northern area of the main vein field, and known gold-silver occurrences. Within the main Cero Cascaron vein field, vertical separation of targets consistent with a classic elevation controlled epithermal model of mineral deposition has been observed with the boiling zone (high grade gold targets) occurring beneath an elevated plateau. Veining has been mapped on a cliff face for over 900 vertical metres, with classic textural evidence of multiple phases of hydrothermal boiling accompanying the highest gold grades. These boiling zones have been established in the upper 380 metres of the vein field, from the north-south trending Carabina and San Pedro veins in the west to the Julieta and Serpiente Dorado veins in the east that are distributed along a hillside over a horizontal distance of approximately three kilometres, with some significant gold grades. Previous mapping and sampling programs have extended these veins to the north onto the plateau where textural observations indicate high level textures that typically occur above boiling zones within veins and represent excellent targets. It is these vein extensions, under the plateau, that were the focus of the soil sampling program. The Cerro Cascaron project covers 69 square kilometres in a historic Colonial-era mining district in the prolific Sierra Madre Occidental precious metals belt of western Chihuahua State, Mexico and has never been subjected to modern exploration or drilling. Soil samples were collected in a grid pattern on east-west oriented lines 200 metres apart with samples collected every 50 metres. The soil grid lines were oriented to sample the northern projections of the Serpiente Dorada, San Pedro and Carabina veins into covered areas at higher elevations with limited outcrop exposure. The sampling extended from the northern property boundaries southwards to the cliffs that mark the andesite - rhyolite contact. Excluding QA/QC samples, a total of 877 soil samples were collected. The area has been mapped as largely underlain by rhyolite flows. The area may represent a rhyolite dome complex with rhyolite tuffs interbedded with andesites and all cut by rhyolite dykes. These rocks are overlain by ignimbrites at the highest elevations and probably represent the Upper Volcanic Sequence of the Sierra Madre Occidental. A series of sample plots were developed that utilize a combination of anomalous levels for multiple elements. Thresholds were set at two, three, five and ten times average crustal abundances for several elements of interest and, as this is a statistically significant data set, percentile levels for elements of interest and pathfinders were calculated and used as a confirmation tool and as an additional reference. A varied multi-element geochemical response was found for each of seven vein corridors, using the elements gold (Figure 1), silver, and the pathfinder elements lead, manganese, barium, mercury, antimony, arsenic and zinc (Figure 2 and Figure 3). As noted above, the area around the Serpiente Dorada and new vein corridor target, define extensive gold and silver soil anomalies coupled with arsenic and antimony anomalism. The Carabina, San Pedro, and La Puerta areas show a more muted but significant soil response in gold, silver and pathfinders along strike from known gold-silver mineralization and two additional areas between San Pedro and La Puerta, have significant pathfinder element responses. As a follow-up, detailed mapping and sampling will be conducted in the current exploration program, prior to determining drill targets. Readers should refer to Evrim's press releases dated June 8 and August 17, 2016 and Harvest Gold press releases dated June 8 and 15, 2017 for a full description of previous exploration results. Cerro Cascaron's setting and mineralization is similar to many epithermal deposits in the Sierra Madre Occidental, including Fresnillo PLC's La Cienega Mine in Durango, Goldcorp's past producing El Sauzal gold mine and further south, First Majestic's San Martin de Bolanos silver mine in Jalisco State. The property is approximately 55 kilometres southeast of Goldcorp Inc.'s past-producing El Sauzal gold mine and is one of the few unexplored and undrilled opportunities in the region. Mr. Warren Bates, P. Geo (APGO#0211), the Company's Director of Property Investigation, is the Qualified Person for this press release for the purposes of National Instrument 43-101, and has reviewed and approved the technical information herein. Evrim Resources has advised that their quality control procedure is as follows: Samples were delivered to ALS Global in Hermosillo, Sonora for sample preparation and to the ALS laboratory in North Vancouver for analysis. The Hermosillo facility has ISO 9001:2008 certification while the North Vancouver facility has ISO/IE 17025:2005 certification. Blank soil samples were inserted into the sample sequence at a frequency of one per 40 samples. Samples were assayed for gold by 30 gram fire assay and multi-element analysis by aqua regia and ICP analysis. Evrim Resources is a mineral exploration company whose goal is to participate in significant exploration discoveries supported by a sustainable business model. The Company is well financed, has a diverse range of quality projects and a database in Mexico and portions of the southwestern United States. The existing projects, and generation of quality exploration targets and ideas, are advanced through option and joint venture agreements with industry partners to create shareholder value. Evrim's business plan also includes royalty creation utilizing the Company's exploration expertise and existing projects. FORWARD-LOOKING STATEMENTS: This news release contains certain "forward-looking statements" within the meaning of Section 21E of the United States Securities Exchange Act of 1934, as amended. Except for statements of historical fact relating to the company, certain information contained herein constitutes forward-looking statements. Forward-looking statements are frequently characterized by words such as "plan," "expect," "project," "intend," "believe," "anticipate", "estimate" and other similar words, or statements that certain events or conditions "may" or "will" occur. Forward-looking statements are based on the opinions and estimates of management at the date the statements are made, and are subject to a variety of risks and uncertainties and other factors that could cause actual events or results to differ materially from those projected in the forward-looking statements. These factors include the inherent risks involved in the exploration and development of mineral properties, the uncertainties involved in interpreting drilling results and other geological data, fluctuating metal prices, the possibility of project cost overruns or unanticipated costs and expenses, uncertainties relating to the availability and costs of financing needed in the future and other factors. The Company undertakes no obligation to update forward-looking statements if circumstances or management's estimates or opinions should change. The reader is cautioned not to place undue reliance on forward-looking statements. Neither the TSX Venture Exchange nor its Regulation Services Provider (as that term is defined in policies of the TSX Venture Exchange) accepts responsibility for the adequacy or accuracy of this release.